The Skyknight was large as it needed lots of room for fuel. Ithad two engines as only one would not have provided enough power. There were twocrew members as one was needed to operate the radar equipment. The aircraft hadno ejection seats and entrance to the aircraft was gained by climbing up on thespine and then entering through a sliding hatch in the transparency. Emergencyexit was through a chute in the underside of the plane. Since the plane sat solow to the ground, it was impossible to enter through the emergency chute,though that and several other traits were carried over into the much larger A3DSkywarrior. The F3D proved to be a tractable and stable airframe, perfectfor night interception. Though initially only armed with guns, the Skyknight wasone of the first aircraft to ever carry the Sparrow missile, albeit as adevelopment platform. 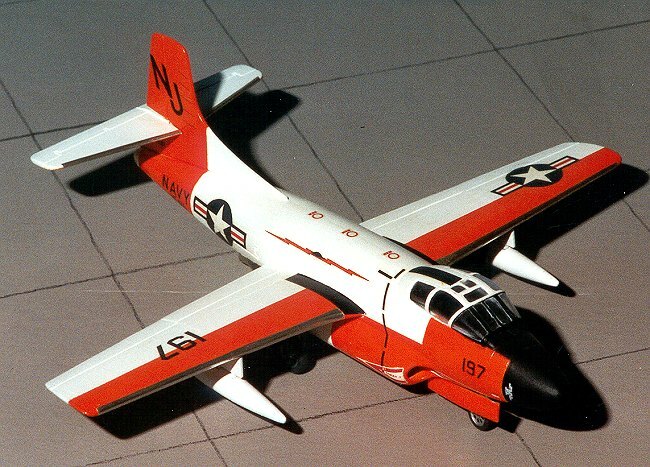 The F3D was proven to be a capable night fighter, shootingdown several aircraft during the Korean War. The biggest problem of the aircraftin that war was that it was too fast. Night interceptions were generally againstsmall, low-powered biplanes, making it difficult for the larger Skyknight togain an easy kill. 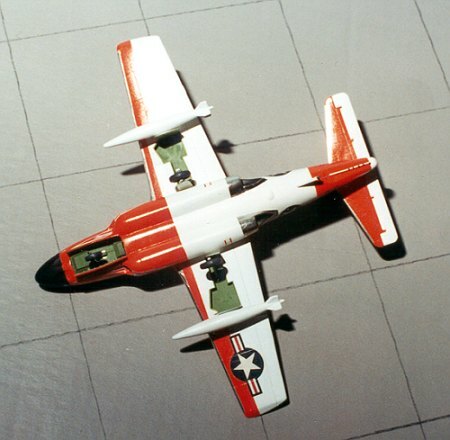 The aircraft soldiered on for years after operational service asa trainer and weapons test platform. One of the last F3Ds was used by the USArmy for several of its electronics and missile test platforms. Several arestill extant in museums. I have to be honest and tell you that it has been a number ofyears since I built this kit, however, I can still recall much about it. Itcomes in Matchbox's wonderful multiple colors of plastic. I guess it is agimmick, but makes for difficulty in painting. Typical of Matchbox, the kit isnot difficult to build. One reason is the lack of any real detail in the kit.Panel lines are raised on this one, though there are not many of those. Theinterior detailing is almost nil consisting of a tub and a couple of seats thatlook nothing like what is in the real aircraft. There are underwing stores inthe form of two fuel tanks. There is no detail in the main wheel wells andthey are open. The nose gear well is boxed in, but has no detail. Thetransparency is thick and has large frame lines. Landing gearlegs are thin, but have not broken in years of handling and moving around. Thereare decals for two versions: VF-121 in the white and orange scheme, and an allblack one from VMF-513 in Korea. This one inthe picture is from VF-121 and used as a navigation trainer. The decals workquite well, their only real downfall is the white being more of an ivory colorand it isn't opaque enough to block the orange paint. This last bit isn't reallya slam as few decals are that opaque. They do fit well and reacted well tosetting solutions. Instructions are typical Matchbox. There areseveral construction steps with color callouts being given in one section at theend of the instructions. Only Matchbox does sheets this way, others eitherinclude colors in each step or ignore them altogether. Building (orassembling) this kit is very straightforward. Once the cockpit bits are gluedtogether, they and the interior walls were painted flat black, as was in vogueduring the late 1940s. This also eliminates the embarrassment of not having anycockpit detail to look at. I put a lot of weight in the nose as otherwise, itwill be quite a tail-sitter. Once the interior is in place, the fuselage halvesare glued together. Fit, as with all Matchbox kits is quite good, though many ofthe seams needed filler and sanding. Next, I attached the engine pods. These are probably the worstfitting part of the kit, especially the front engine intakes. However, it isamazing just what filler can hide! After the fuselage was together, the wings were glued togetherand attached. Again, fit is good. Same for the horizontal stabilizer that merelyslots in place, though some filler was needed to fill a few gaps. The drop tankswere glued together, smoothed out, and set aside until the last. The canopy wasthen glued in place and masked in preparation for painting. Painting is probablythe most difficult part of this model. The orange and white scheme requires alot of masking to get right. First off the kit was undercoated in light grey.Then Gloss White was sprayed over the entire airframe. I used a combination ofModel Master enamels and Gunze acrylics for this, Model Master for the white andflat black. I also did the drop tanks and racks in white at this time. When itwas fully dry, the kit was carefully masked, and the orange was sprayed on.Naturally, I messed up a few spots, so some back and forth painting was neededto take care of the glitches. The final painting was the nose and anti-glare shieldthat was done in flat black. Next, the leading edges of the wingsand tailplanes were done in chrome Bare Metal Foil. The engine exhaust was donein titanium. BTW, the wheels and struts were painted white, while the wells andinside of gear doors was painted chromate green. The kit decals were used as Icouldn't find an aftermarket sheet and as I mentioned earlier, they worked justfine with no silvering. No gloss coat was needed as both the white and orangeare gloss paints. Matchbox decals are strong and a bit thick so I did not applya gloss coat over them and they have held up very well. Once the kit was painted and decaled, the final bits were added.This consisted of the landing gear, wheels, gear doors, tail hook and the tailbumper. Now this last piece has broken off a number of times despite my attemptsto be careful when handling it! Once it was on its gear, the drop tanks andmounts were glued in place and the kit was done! As you probably notice from theimage above, I didn't add enough nose weight so had to put several pieces in thenose gear well. Frankly, I was both surprised and pleasedwhen Matchbox released this kit. 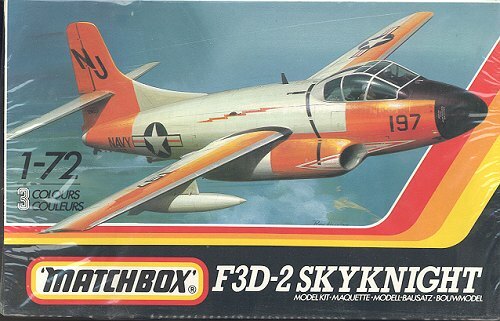 Matchbox has released injected kits that no oneelse has ever done, including the Seafox, Siskin, He-70, Victor, Stranrear,Heyford, PB4Y-2, T-2C, Provost, Do-28, Wellesley, and a number of others. Nowthat Revell has bought the company, we can only hope that we will see some ofthese reissued in the near future.